This high temperature, heat and flame resistant graphite coated fiberglass rope will withstand temperatures of 1000°F / 537°C continuous exposure. The base high temperature and heat resistant knitted fiberglass rope is fabricated from high quality type E fiberglass that will not burn. The rope is then coated with graphite, adding lubrication. This rope resists molten splash and welding splatter very well as it cannot stick to the graphite. 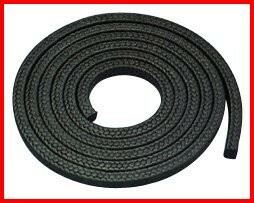 The base rope is rated to a higher temperature however the graphite coating limits ts use to 1000°F / 537°C.